On this day in 1506 construction began on the new St. Peter’s basilica in Rome. Constructing the new church meant deconstructing the old one–the venerable old basilica built by Constantine–CONSTANTINE!— in the fourth century. It had stood on the site, perfectly serviceable, until preferences in taste changed. And then its aesthetic character failed to serve the very significant function of beauty. Yes, beauty has a function, and it’s an important one. If anybody understood that it was Pope Julius II (1443-1513; more on him later–check back in September). For the pope, Constantine’s big preaching barn–in spite of its provenance, dating back to the first professing Christian emperor–was simply not Roman enough. Down it came, to be replaced by an extraordinary composition by Donato Bramante (1444-1514). One of the first great Renaissance architects in Rome, Bramante conceived of the new church building taking the form of the dome of the Pantheon lifted onto the vaults of the Baths of Caracalla. An apocryphal description to be sure, it’s still a good one, and more likely than not the main gist of his design. Problem is, that design was not completed (although it did set many of the parameters for later architects, like Michelangelo, to follow). It’s known only partially through a number of resources that each reveals only part of the idea. 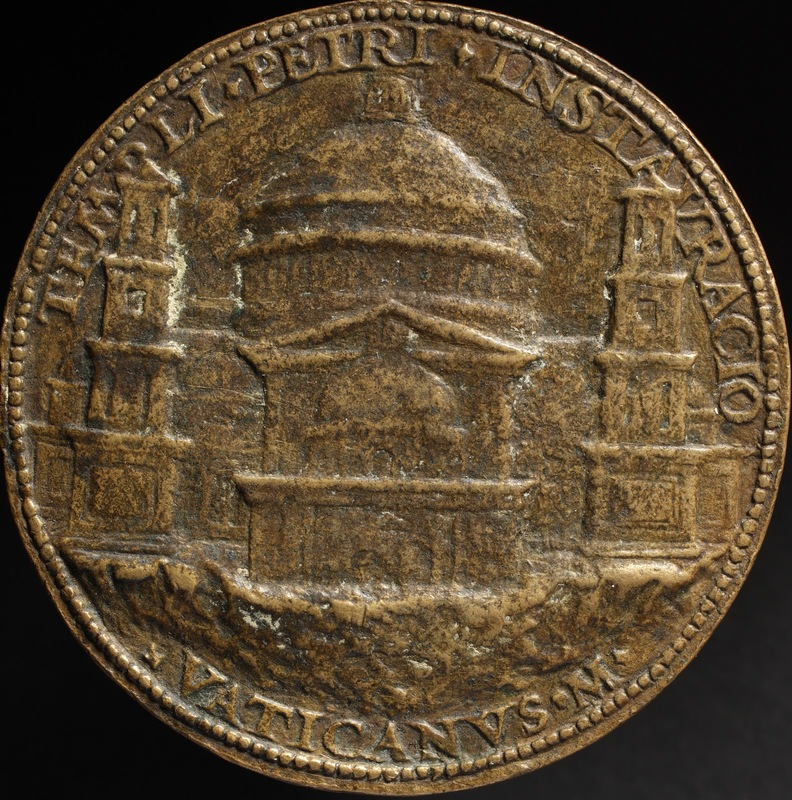 The foundation medal, struck at the time of the groundbreaking, shows a domed structure with a pedimented portico and curious staged towers. Treatise writers like Serlio, who elevated Bramante’s reputation to be on par with the ancients, included images of the dome in their sixteenth-century (and later) books. Only one drawing of the building from Bramante’s hand exists, and it raises as many questions as it answers (is it a half-plan? was it centralized? is this just the apse end? tell us, Bramante!). Maybe the best view of the would-have-been church was projected in a fresco that was begun within years of the groundbreaking and by colleague Raphael (above). 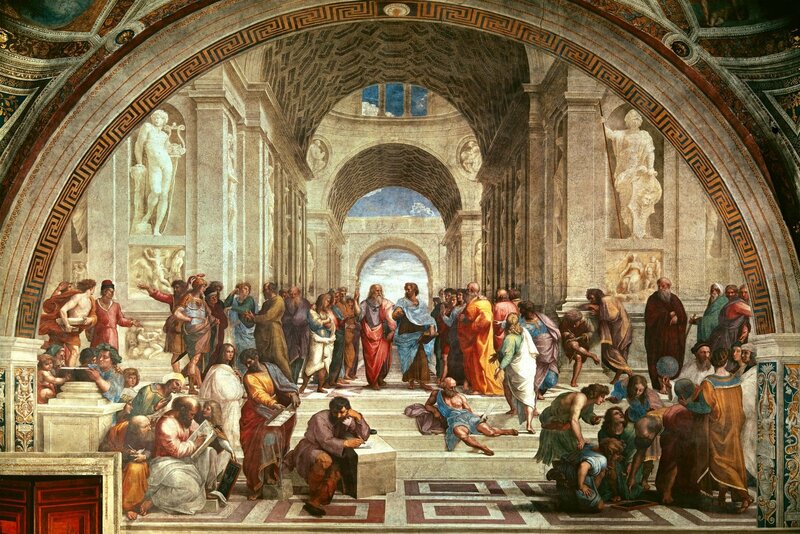 It portrays a gathering of the world’s great thinkers including Plato and Aristotle (at center), Epicurus, Pythagoras, Dante and Michelangelo. While the painting presents a simple, stunning view of significant contributors to the development of Western culture, it sets them in a make-believe place characterized by Roman vaults with a dome at the center. Is it Bramante’s basilica? Among the later architects who revered Bramante, Michelangelo (1475-1564) paid one of the greatest compliments by suggesting that to depart from Bramante’s plan for St. Peter’s was to depart from truth (three centuries would pass before Keats made the connection between beauty and truth in a poem, but it’s already here). This esteem is further evidenced by the portrait of Bramante that Raphael included in the School of Athens–the stooped teacher to the far right, identified as the great Euclid, known as the father of geometry, was given the balding head of Bramante, the father of the Renaissance. You are currently reading April 18: barn, basilica, beauty at Clio’s Calendar: Daily Musings on Architectural History.